Summary: I don’t have time for our usual analysis of the monthly US jobs report. Here’s a brief with the important news. For a fast analysis I use the household survey. Although less accurate than the establishment survey, BLS does not revise it — providing a firm if broad baseline. Since this data is noisy, we’ll look at the two-month change — from June to August. All numbers re in thousands, seasonally adjusted. The number not in the labor force rose by the number of new adults plus those who lost jobs plus those who dropped out (eg, gave up, retired) of the labor force. Multiply those percentages by six and you get some serious bad news. Looking at individual numbers allows people to spin both big optimistic and pessimistic assertions. The overall picture shows a significant — but not yet conclusive (it’s only two months) — deterioration from the slow growth of the past two years. Bad news for Obama. But no surprise since the entire world economy is slowing, especially Europe and China. We are one world. No, we are not in a recession. Since mid-2009 we have been in a slow recovery, far slower by most (not all) metrics than the average of the post-WWII era — and by some metrics the worst. That’s ugly since we’ve applied the largest and longest in duration fiscal and monetary stimulus ever in US history. That we got so little from it shows the size of the downturn, similar in most respects to that of 1929, and its poor design. See the details at today’s report by the Bureau of Labor Statistics. Previous Post What would a gold-backed currency do to America? I would like to see some data showing the # of retirements vs people actually giving up on finding a job. This is close to the peak time period when the baby boomers are getting out of the workforce and the timing of that along with the economic cycle and recession would be interesting to analyze. Or maybe I missed that when FM did the analysis! In the report (follow the link in the post) is much of the information you’re looking for. Employment data by age, number of discouraged workers, etc. “peak time”? Try just the beginning. And I’ll tell you, those so called Boomers who sat around and philosophized about life and such in their 20’s will not just go away and quit working, at something. 25 to 35 yr olds are, as they say: Almost in a panic. Forget this Place. Without significant Job Growth of real paying types…..well. You think Obama was bad? Peak year of baby boom births was 1957, although they were flattish thru 1961. So peak retirement will be 2022 and afterwards. This is one of the enduring aspects of human nation, seen in every civilization over time: simple and emotionally satisfying mythological explanations for complex phenomena. As in this quote — presenting material that is obviously false to anyone familiar with modern economic history. Many of the insights in Austrian economics are useful and powerful, but their disconnect from the empirical research of economics has led to a lack of rigor in their work. Austrian economics tends to read like philosophy, with little attempt to use the vast history of economics to test their theories. At some point they’ll be integrated into the mainstream of economics, making the field much stronger. Until then Austrian economics remains primarily a political tool, unused for economic management. The useful contrast is with the Stockholm school of economics (Wikipedia), not much more empirical — but proven by 80 years of practical use. But it’s little known in the US because it’s of no use to our elites. You are somewhat correct to the extent that you point out that Austrians don’t get bogged down in mathematical rationalizations, charts and graphs attempting to lend credence to preconceived notions of the results of human behavior, nor to justify political expediency. Nor do they drink the coolaid of the NY and eastern bank propaganda machine that some writers on this website buy into, while pretending to rail against it. Christine Romer, Congressional Budget office, and Krugman. Really!! Genius is making complex issues simple. Political tool? Me thinks you need to re-think, and lay off the coolaid. Keep at it — you’ll get there. The political elites that you are so fond of criticizing want you to believe that it’s all too complex to understand — why do you keep singing from their hymnal and dancing to their music? There’s a big problem with asserting that a drop in the proportion of the population in the labor force is economically bad. Germany has a significantly lower proportion of its population in the labor force than America does right now, yet the German economy is going like gangbusters compared to ours. Here’s the bureau of labor chart for the American labor force participation rate (in 2011, 64% of total population) compared to a FRED chart of the labor force participation rate in Germany (in 2011 59.2%). If lower labor force participation rates augured bad economic tidings, Germany would be much worse economically than America right now — but as we, see, the opposite is the case. Germany remains one of the strongest economies in the world with a huge trade surplus and low deficits and dynamic fast-growing economy, compared to America with a huge trade deficit and high deficits and a lackluster slow-growth economy. As proof of the above statement, here’s a chart of the German GDP growth rate out of the recent recession up to 2010 (4% and climbing). And here’s a chart of America’s GDP growth out of the recent recession up to 2010 (2% and dropping). Which economy looks more robust to you? Yes, yes, yes, no. German GDP grew 0.5% in 1Q2012, 0.3% in 2Q2012, and now the perspective is that Germany will enter recession in 4Q2012. Indeed, the performance of the German economy is mainly determined by exports. Domestic demand has remained stunted for the last 10-15 years because of (1) relentless wage compression to make the German export machine competitive and (2) demographic contraction and aging. Notice the resulting sensitivity of the German economy to international economic conditions in the article you link to: almost -7% in 2009, whereas the USA had a variation of barely -4.5%. Germany has deeper and more robust industrial foundations, but is vulnerable because of (1) its extreme dependency on exports and (2) its sheer financial involvement with doubtful debtors, especially in the EU (the entire German banking system is in a sorry state and laden with paper from the GIPSI). Guest goes to the heart of the situation. Nations like China and Germany have become export powerhouses. But that requires other nations to run unsustainable trade deficits. It’s not sustainable, and now that game is ending — as both China and Germany see their trade deficits shrink and their economies slow. Rebalancing might prove painful. Economics is mind-bendingly complex, like all the social sciences. Demographic change can be destabilizing, especially changes in the dependency ratio from aging. This can be handled well or poorly. Germany has handled it well, with its socialist heritage and strong unions maintaining social cohesion. Furthermore they have profited by rigging the European Monetary Union in their favor, causing the divergence between their prosperity and that of the PIIGS. So we can learn much from Germany, but only carefully. Isn’t there an additional factor? Germany has a robust safety net and much higher taxes than we have. They fund their government and they provide their citizens with health care, education, pensions and generous unemployment. In America, if you are not working and not drawing Social Security, you are in trouble. So the news that the percentage of non-working Americans is going up means less tax revenue, more draws on state budgets at a time of massive deficits, and more desperation. Agreed! There are substantive differences between the European social systems and ours. Social cohesion in the periphery has lasted far longer under great stress than many of us expected — and this has certainly contributed. Much depends on how long this happy state continues. My current favorite gauge of the jobs picture is the employment-population ratio for prime-age adults (25-54). EP ratio instead of unemployment rate, because U may be distorted by workers dropping out. Prime-age not because the old and young don’t matter, but to take demographic change out of the picture. And here’s what it looks like. A plunge and a stabilization at a depressed level, which has now gone on for almost three years. Everything else is just noise. FM and Guest make excellent points. 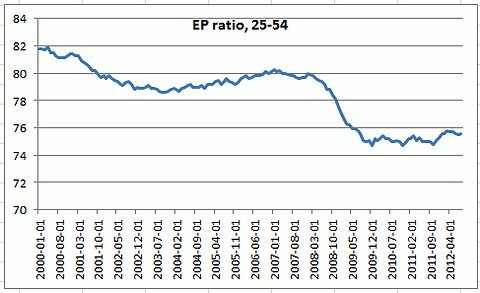 I’d like to see the EP ratio for Germany over the last 12 years from ages 25-55 but can’t readily find a chart of it. Economic performance is relative, and comparing that graph with America’s would prove illuminating. Perhaps more important than the raw EP ratio is the fact that Germany’s middle class appears to be solid and growing, while America’s middle class is clearly eroding. Germany used to have much higher unemployment among young people ages 25-35 than America, but recently Americans age 25-35 have lost ground rapidly. FM & Guest assert that Germany’s export-based manufacturing base explains the relative strength of their economy. Could it be that Germany’s refusal to waste vast amounts of their money on a largely useless military-police-surveillance-torture complex (unable even to win wars against barefoot 15-year-olds in the world’s poorest countries like Afghanistan) and on worthless endless unwinnable social “wars” like America’s insane and ever-increasing War on Drugs and War on Copyright Infringement. Of late spending has exploded on American “domestic surveillance” AKA turning the U.S. into a steroidally bloated version of East Germany where the main activity of the government involves spying on its own citizens. We saw lots of this in East Germany but little in the new united Germany. I have to suspect that spending the monies not wasted on these self-destructive activities has added a lot to Germany’s infrastructure and economy. Little noted in these raw economic statistics? The startling superiority of German’s quality of life to America’s in most areas. Germans have access to internet connections 10x faster yet 1/4 to 1/7 the cost of those in America, bullet trains that travel 3x as fast as those in America and much better maintained, busses on dense routes in major German cities that run as often as every 5 minutes, excellent medical care for every citizen at a very modest cost (no German gets bankrupted by medical bills or turned away from a hospital because of inability to pay), a higher education system that’s pretty close to free for most German citizens. Compare with America. Thomas, your comments are valid in our current perspective but things can change mighty fast. Compare the US in 1965 vs. 1975 or Japan 1985 vs. 1995. Neither country suffered from an invasion or a major natural disaster but both were brought low by catastrophically bad decisions that did not seem like big issues at the time. The single biggest challenge of managing a successful economy is to keep your own hubris from destroying yourself and critical failure can occur in many ways. Germany may well see something similar as the European crisis continues to unfold. Here is one with a long-term graph, but only till 2008 (curve for men in yellow, for women in grey. Yes, all those documents are in German. Do not forget that Germany spent unprecedented sums for the reunification, The whole operation left the country saddled with a considerable debt. The “Institute for the Study of Labor” maintains a very good database with free access. BTW the German LP is higher than the US one since 2008, the reason for this change: older employees can not longer be sent in early retirement (without medical reasons), this is one of the most important parts of the Hartz IV concept and is in contrast to the minijobs usually ignored. The IZA site is truly an excellent resource. It contains a graph (employment rations, age 16-64, 2000-2011, G7 countries) that corresponds exactly to what Thomas More is looking for. Kudos to ulenspiegel1965. Great charts, well worth reading! “The jobs report in five – nay, six! – charts“, Dylan Matthews, Washington Post, 7 September 2012. Especially the chart of employment by sector. The charts are nice, particularly chart 5 which shows job growth by sector. But I’d like more information. It would be extremely nice to also have average salary for each profession category and the actual number of jobs in each sector. These pieces of information would give us a much clearer picture of what is happening to the American worker. For example, the leisure industry show a slow climb in the number of jobs but I suspect it started with a high base number of jobs and I also believe it has the lowest pay of all the sectors, but I don’t know if the wages are going up, down, or staying stagnant. The logging and mining employment percentage shows the greatest change but started with a relatively low number of jobs. It’s interesting to see how employment in mining and logging has gone up so. Maybe future Americans generations will return to being coal miners and lumberjacks. Honestly, I don’t think that’s all bad — you can’t outsource a forest. Construction, as expected, just murdered by the real estate bubble. IT, manufacturing, look to be re-stabilizing at lower levels. Just based on this, I suspect unemployment will hit a wall, until construction can be restarted. Given the current socio-economic conditions and the trend in the last generation, I am afraid this means that future generations of Americans will be reduced to be hewers of wood and drawers of water. (a) Since resource extraction is such a capital intensive occupation, that seems unlikely. Even a large expansion of mining & lumbering would generate a small increase in US employment levels. I would like to know exactly how the labor force is calculated. Household surveys? How large is the sample and what is the chance of statistical error? It seems strange to me that so many people drop out of the labor pool one month and re-enter the next. See Jan-Feb 2012 and now July-August 2012. The Household survey is a survey. The BLS website describes it in extreme detail. I’ve seen different estimates of the error bars for the employment number of the Household survey. I believe it is 280,000 (68% probability of being plus or minus). You can help improve the numbers: lobby Congress to increase BLS funding. We get the numbers we pay for. Thanks to the commenters for their excellent links to German economic statistics! The commentariat at this forum truly is one of the best-informed and mos astute on the web. Incidentally, if appears that my criticism of FM was incorrect. 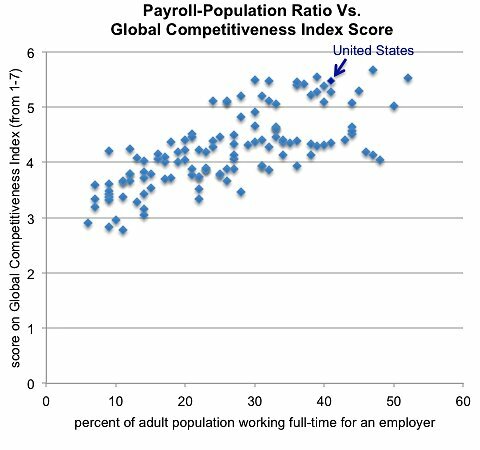 There appears to be a broad (albeit imperfect) correlation twixt the global competitiveness of an economy and its payroll-population ratio. See this chart from the New York Times article “A Look Behind the U.S. Decline in Global Competitiveness” by Catherine Rampell, 6 September 2012. My apologies to FM. I was wrong.